Great anytime from early afternoon till about 7pm then, if like me you are getting old, put your earmuffs on or get out the megaphone. Otherwise nice relaxed gaff, urban chic and truly independant, decent choice of ale in bottle, but after 15 years could do with a change of choice. Only freehouse for miles. Good for a winters Sunday afternoon next to the roaring fire. Can get completely rammed at weekends in the evening, but if you are ther early enough to get a tabla a nd a good crowd, has a great atmosphere. Bar staff can be up themsleves a bit, but are lively to serve and there's ony draft Guinees and bottled lagers, but have had some great long nights in there and liked it so much have even nursed the hangover there the afternoon of the next day. This place is a lucky packet - but i have had more good times here than bad times. The best time to really appreciate this pub is when the late afternoon / late evening. Best for me is in winter on the weekdays before it gets busy - grab a beer and sit around the fire. Went to Clapham Junction last night on a recon mission to find the most appropriate bar to go on Friday night with friends over from Ireland. 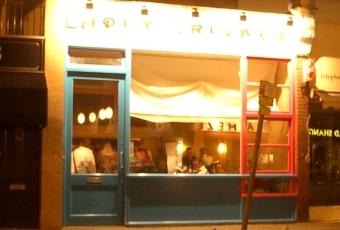 I had a shortlist of 6 bars and had high hopes for The Holy Drinker as it had good reviews and a really good website. We didn�t choose it in the end as it was too small (bordering on pokey � the cinema seats were tiny), too expensive (�7.40 for a beer and a whisky/soda), not much in the way of draft beer (Guinness only) and closed too early for us (midnight). On the plus side it was pleasantly quirky and the more fashionable girls in my crowd would have loved the atmosphere and music. Staff were amiable enough. its a nice looking pub/bar, I'll give it that, but the atmosphere is killed by the rudest staff I've come across in months. I work in the bar business so I'm a courteous customer, but damn, this crew hate the fact that they have to look at you. Unpleasant stuckup bartenders who can't make a drink and make snotty comments to customers -- what a great place! We left after one.